The news of the murder of the young Palestinian found dead, Muhammad Hussein Abu Khodeir, 16years old, has provoked violent protests and Police and Palestinian youths have clashed in East Jerusalem. According to the press agency Maan Palestinian, the police used rubber bullets and tear gas against the crowd protested to Shuafat, the neighborhood where he lived the young killed, injuring at least 12 people, including the reporter palestinian television Kristine Rinawi and two cameramen Ali Yasin and Ahmad Gharabla. SITES Israelis have reported of stone throwing against the police and burning tires by protesters. Police said that they were yet to determine whether the boy’s killing was nationalistic or criminal in nature, while Palestinian rioters believe he was killed by Israelis as revenge for the kidnapping and murder of three Israeli teens. Palestinian Authority President Mahmoud Abbas called on Netanyahu to make an outright condemnation of the killing of the Arab youth, Palestinian news agency Ma’an reported. Abbas demanded that Netanyahu denounce what he said was the kidnapping and murder of the 16-year-old. He also blamed the current atmosphere of tensions in the region on Israel, calling for “real action” to prevent attacks by settlers. The Palestinian leader said that Netanyahu should condemn the murder of the Arab youth, just as Abbas had condemned the recent kidnapping and murder of three Israeli teens. Jerusalem has been tense since the bodies of the young Israeli settlers were found, and the police have beefed up their presence in Palestinian neighbourhoods. An Al Jazeera journalist at the scene reported saw at least two Palestinians hit with rubber bullets during the pitched battles in Shuafat, a Palestinian neighbourhood. Other sources said 30 people had been injured and that three Palestinian journalists had been hit with rubber bullets. Israeli police told Al Jazeera that they received a call early on Wednesday about an alleged kidnapping in Shuafat. They said they had not established a link between the alleged kidnapping and the body, which was found in a Jerusalem forest. Local media have identified the missing boy as 17-year-old Mohammed Hasan Abu Khdair. “I call on all sides not to take the law into their own hands. Israel is a nation of laws for all and all are compelled to follow the law,” Netanyahu said. Nir Barkat, the mayor of Jerusalem, said that he “vigorously condemn[ed] the barbaric murder”. Israeli newspaper Yediot Aharonot reported that the body was “charred, and showed signs of violence”. The body was discovered hours after Israel buried the three settlers, whose bodies were found in a valley outside Hebron earlier this week. They disappeared on June 12 while hitchhiking home from a religious seminary in the occupied West Bank, setting off a weeks-long manhunt. 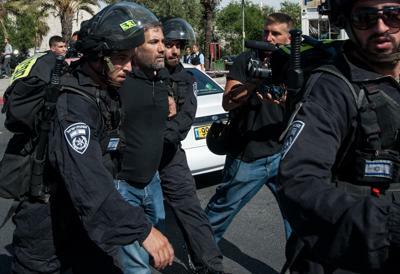 Nearly 50 people were arrested at right-wing demonstrations on Tuesday, during which protesters chanted “death to the Arabs” and tried to assault Palestinians. The police said one man was jailed overnight for attacking a Palestinian worker in a fast-food restaurant in the city, and two other assaults were reported on Tuesday.